A fully mobile Pizzeria in a van, bringing delicious wood-fired pizza to a location near you! The taste of great authentic pizza in Norfolk and most of Suffolk. Our van has been professionally converted by a local company and has been built to commercial kitchen standards and fitted with a top of the range Italian made wood-burning stove. 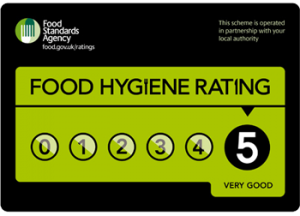 We’ve been awarded our third 5 star food hygiene rating by Broadland District Council ! All our staff are qualified to a minimum of food safety level 2, and they know all about food allergies and intolerances so please ask if you have any concerns. We also operate a strict policy of non-cross contamination between our meat based ingredients and those suitable for vegetarians and vegans, using separate boards and tools. We’re fully insured holding public and product liability insurance and operate a responsible due diligence system. The environment is really important to us and we encourage recycling wherever possible. We only use pizza boxes when we have to and these are made from recycled material and are fully biodegradable. We burn kiln dried Norfolk Ash and wood briquettes made from 100% dry beech wood chippings which produce little or no smoke. We think it’s the small things that make the difference, and that’s why we focus on every little detail. Our herbs are always fresh, never dried. Our pizzas are all made with love and care and we truly value our customers. We genuinely appreciate any feedback that can help us to make your Broadside Pizza experience even better, so please Get in touch.